By: Kroll Map Company, Inc. 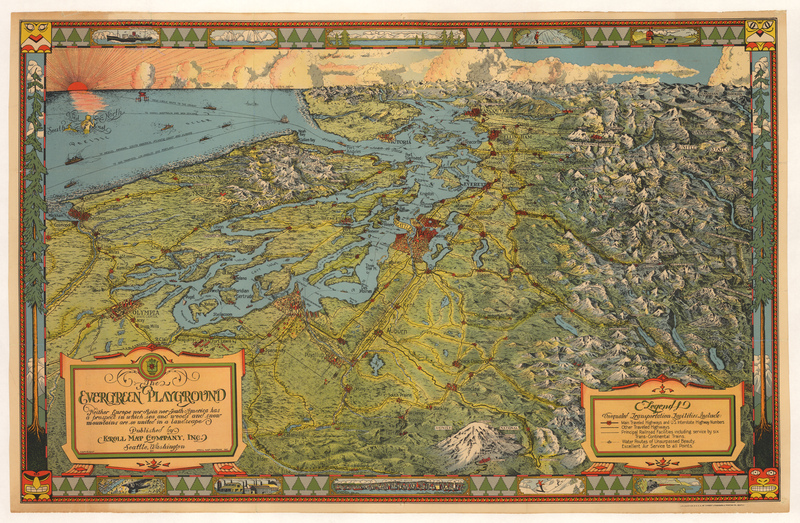 This is a finely rendered bird’s-eye view of Western Washington and Puget Sound as view from behind Mount Rainier. Included in the view is the entire Olympic Peninsula, depicting Shelton, Port Townsend, Port Angeles, Neah Bay, and all Pacific beach communities of the day as far south as Hoquiam. All towns and cities are depicted with individual buildings. Also featured are the cities of Olympia, Tacoma, Seattle, Bellingham and the Canadian cities of Victoria and Vancouver. The Cascade Mountains are beautifully shown, extending into Canada. Produced to promote tourism and business, the map suggests that there are ‘Unequaled Transportation Facilities’ to be found, including highways, railroads, water routes and air service. Delineated ship routes include freighter lines to the Orient, Hawaii, Australia, New Zealand, Mexico and many other destinations. The map is surrounded by a decorative border which includes modern motifs such as modes of transportation and traditional ones such as totem poles of the indigenous peoples. Various recreational and commercial activities are included. The beautiful compass rose is a mermaid in the Pacific, just below a stylized sunset with glowing clouds. A decorative title cartouche and a legend further embellish the map.